Winter is indeed on it’s way and these three pictures sum up just why we LOVE the chilly Winter weather in the Midlands. Break out the Winter coats! It’s not often in KZN that we get to adorn our warmest coats, BUT as Winter sets in in the KZN Midlands a Winter coat is a saving grace. Our best days are when the sun is out and we meander the twists the turns of the Dargle Valley, stopping off for a picnic by a dam or a cup of coffee at a coffee shop. It’s the best way to spend a Winter’s day. Each of our cottages is fitted with a working fireplace and we replace/replenish the wood supply daily so you will be sure to arrive home to fresh wood ready to be lit. Snuggling up by the fireplace as it heats your cottage up, is one of the best family memory making experiences in Winter. Of course the best way to warm up on a Winter morning is with a tasty cup of tea, coffee, or hot chocolate. Our personal favourite is a coffee from either Terbodore Coffee Roasters or Steam Punk Coffee (both Midlands based coffee roasters/cafes). Make sure you pack your warm drinks before you set off for a Midlands visit in Winter. What’s your favourite thing about visiting the Midlands in Winter? If you are looking for a place to stay, whether for a weekend or longer, you can email us on booking@lemonwood.co.za and we’ll let you know what dates are available. Take a look at our website with a full gallery of images for each of our cottages and the main house (which we also rent out). You’ll find that link here. We hope to see you soon! Have a super day ahead. Yes it’s true, there are real benefits to getting away for a weekend or a few days. Not just for your general morale, but for your overall body and soul. We love that Lemonwood is a place for many people to retreat to. A haven of peace where one can just enjoy the nature around them. Lemonwood Cottages are surrounded by forest and the Dargle hills, where birds are chirping and traffic is a far cry away. Getting away for a weekend is easy as we are located on the Midlands Meander, and just a few kms off the R103. Here are 5 reasons why getting away is good for your body and soul. Sleep is so important for our bodies. Sleep allows our brains and immune systems to catch up and be replenished. Sleep allows your brain to take time out to make sense of everything that has happened over the day/weeks and with enough sleep you can wake up with clarity of mind and soul. Getting away for a weekend may be just the way you can get in those extra zzzz’s. We’ve all heard the saying “a change is as good as a holiday” well combine change and holiday and you’ll feel like a new person. We speak to so many people who say they just needed to get out the city for a few nights to gather themselves. Sitting out on the porch of your cottage, ponder overing the infinite view towards the Drakensberg does wonders for your body and soul. These images of peace and beauty release endorphins into our minds which aid in feelings of joy and calm. A calm mind equals a calm body. Getting away sometimes means getting active. Walking, hiking, day trips around the meander. All these activities are stimuli for our brains, which produce positive and constructive pathways. This inevitably leads to a more positive outlook on life which influences every day we live. A morning walk through the Lemonwood forest may be just what you need to feel alive and active again. Everyone is unique, and with the constant barrage of comparison in today’s society sometimes it is vital that we get away for some alone time. Alone time allows one to connect internally with their emotions and state of being. Pack a journal, your book, or your ipod with your favourite music and get away by yourself for a few days. Get to know yourself again and enjoy every moment of your ‘me-time’ as you are reminded of the amazing person you are. On the flip side taking time out with friends and family is also a big part of what our bodies and souls need. Your kids may be needing quality time with you and a weekend away in the Midlands may be just the thing you need. Been working nights for the past few months, plan a weekend away with mates where you can reconnect and laugh together around a braai. It’s moments like these that remind our minds that we value ourselves. Making time for these getaways will naturally improve your well-being and sustain your body and soul longer. These are just a few reasons why getting away is so important for us as human beings. Pick one or all and treat yourself to some time out. If it’s not in the Midlands, then anywhere you desire. However if the Midlands sounds like a good idea, drop us a mail to book a cottage at Lemonwood. We all know how easy it is to Google and now it’s even easier to find people, places and deals on Social Media. I’ve noticed that more and more Facebook is becoming a second Google when searching for restaurants, B&Bs etc. So we’ve made very sure that we are on Social Media and you can find us easily. Search for us typing ‘Lemonwood’ into the search bar, or you can use the URL www.facebook.com/LemonwoodDargle. You’ll see this as our profile and cover image. We post about 4 times a week and update our fans on specials, accommodation rates and things happening in the Midlands. We also post regular pictures of the beautiful birdlife in the forest surrounding us. We are also on Twitter. This Social Media is quick and easy. It’s somewhat of a constant stream of news. We use Twitter to connect easily with people and brands. We love how instantaneous it is and so we share info about specials, events and general accommodation. Our Twitter handle is @LemonwoodDargle. This is what you’ll find. Lastly we are also on Instagram @LemonwoodCottages. We are still growing our community so we’d love you to go ahead and follow us. We love sharing pictures from around the forest and of our cottages. If you come and stay please tag us in your pictures as we’d love to share those too. This is the page you’ll find. We hope you find it easier now to keep in touch with us. Comment, tweet or tag us in your pictures ’cause we so enjoy hearing from our friends and guests. If you’d like to book a stay just drop a mail to booking@lemonwood.co.za and we look forward to having you. Unlike the music and pop culture of today say, our Christmas time is HOT! There is no snow and eggnog, no sleigh rides or hot chocolate. We’re all about sunshine, SPF, and ice water. So here are a few tip to surviving the Christmas heat. Keep a water bottle at your side : Water is so necessary to replenish our bodies. As we sweat (which we do a lot of in this heat) we need to replace that lost water to our bodies. This will prevent dehydration and even heat stroke. Leave the house with sunblock on and pack it in your bag : the sun is harsh at this time of year and when you’re visiting the Midlands and walking around you are in direct sunlight. Reapplying sunblock throughout the day will make sure you don’t burn. Stock the fridge with fresh fruit : watermelon, strawberries, and litchis are the best fruit for those hot summer days. They are packed with juice and you can even leave them in the freezer a bit for a little extra cold crunch. Pool, beach, shower : scrap the movie nights and indoor lunches. Take your party outside to the pool or beach… and if you don’t have either near you, jump in a cold shower to cool off! We love Summer and the Midlands is such a great place to be at this time of year. Midmar Dam is full of activities, and the riversides are buzzing with fisherman and their kids. Christmas time is all about community and we are so grateful for the community growing around us all the time. Make a plan to visit our part of the world and stay in one of our cottages in the Dargle Valley. We’ll point you in the right direction of where to go and what to see during your visit. Until next time, have a HAPPY HOLIDAY! Looking for accommodation in the Midlands? Our cosy country cottages are nestled alongside the Dargle Valley and the Lemonwood Forest. A tranquil retreat at any time of the year. Get a feel for our cottages and surrounding areas by watching this video tour of Lemonwood Cottages. We have 4 cosy country cottages at Lemonwood. Each unique and tucked away in their own part of the property. Here is a look at each one to make your accommodation decision easier. We also book out the main house which sleeps 10 if you are wanting to host a big family funtion. Alternatively we can book out all the cottages. Email us on booking@lemonwood.co.za for more info. Have a look at more images on our website www.lemonwood.co.za. Did you know that we’re on Instagram, and boy are our photos beautiful! Yes we are allowed to be a little bias, but come on we live in the most incredible part of the world. Every day we overlook the most magnificent valley and around we is this plethora of greenery, full of birds chirping and buck grazing. Go on, give our Instagram page a follow, and if you use the hashtag #stayatlemonwood we’ll feature your pictures on our Instagram page too! 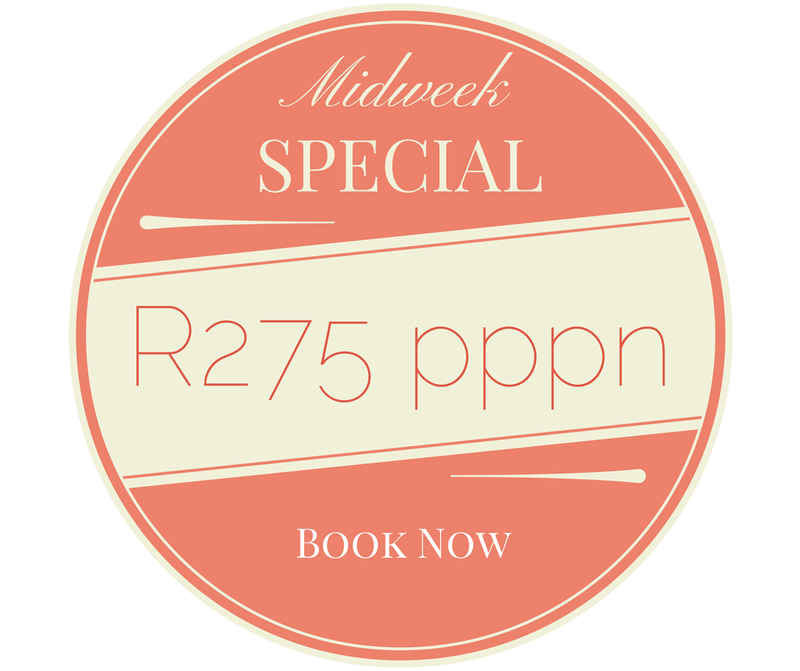 Yes our midweek special rate is back. Stay at Lemonwood from Monday to Thursday for just R275pp per night, and R195 per child per night. To book your week away send us an email booking@lemonwood.co.za and we look forward to having you! *Please note that mid week special rates do not apply to staying in the main house, only the cottages.